This figure was a landmark for Marvel. It was the first incarnation of what was to become one of their most replicated characters: Wolverine. The new X-Men had only just gained popularity at the tail-end of the Mego era in the 70's and thus none of the X-Men were ever created for the World's Greatest Superheroes line. However, with the growing popularity of the new X-Men lineup (under the auspices of Chris Claremont and John Byrne), the team was featured prominently in the Secret Wars comics. Of the new team, Wolverine was a fan favorite. He would go on to be the most produced character of the later Toy Biz X-Men line. 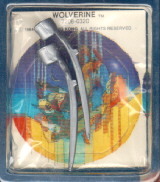 The Secret Wars Wolverine came with two claw attachment accessories. These were easily lost and are often missing from loose figures. As with many of the Secret Wars figures, Wolverine had some detail painting on the figure's body that was easily worn off. On this figure, the area is the belt-buckle, detailed in black. The figure is notable for being the only figure in the entire line to have a significant variation: The infamous claws. Convention holds that the silver claws version is more readily found than the apparently rarer black claws version. To date, here has been no satisfactory explanation for the existence of both Black and Silver claws versions. 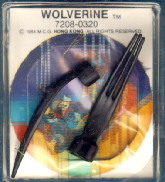 Although Wolverine was a popular figure in this series, the claw differences are generally believed to be a variation rather than a separate release (as was done with the Black Costume Spiderman).